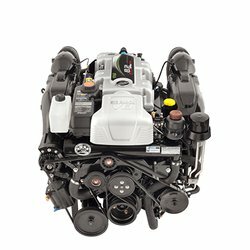 Check out the complete line of Quicksilver Care and Maintenance Products for your Sterndrive Engine. Click here. Sterndrives are just automotive engines? They most certainly are NOT. There was a time long ago when it was somewhat fair to say that a marine engine was simply an automotive engine thrown in the back of a boat and given a propeller. In the good old days, car engines were built stout and were unashamedly ‘over-engineered’. And that suited us just fine. But over the years, the automotive industry has been forced to take a different path. The industry needed to produce more compact and lightweight engines to help meet ever strict fuel economy regulations. But lighter engines mean less robust parts. Less robust parts mean reducing engine RPM’s (revolutions per minute). But marine engines need those higher engine RPM’s to move a boat effortlessly through the water. So a fork in the road was forever created. Today, automotive oil pumps, pistons, connecting rods, pulleys, starters, valves, springs, filters, electrical components, and camshafts (just to name a few!) are simply not up to the task of surviving as true marine components. So take it from us, the next time you hear someone say that a marine engine is nothing more than a car engine in a boat, know that nothing could be farther from the truth. Quicksilver: Purpose built for the marine world.